Screenshot from the anime Aoki Densetsu Shoot. 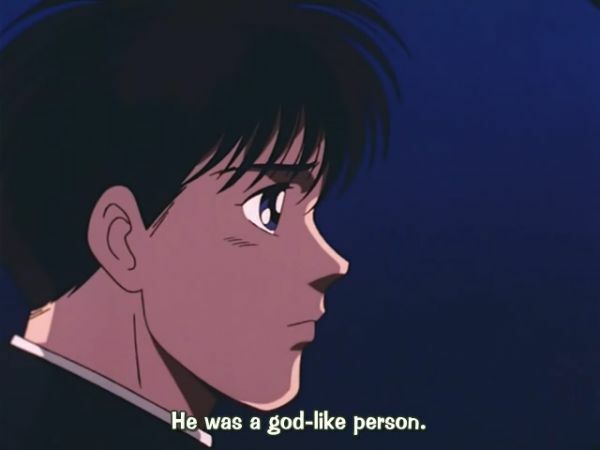 “He was a god-like person.” In Japan’s Shinto tradition, the border between the human and the divine is still more porous than here in the West with our centuries of monotheism. So much so that even a soccer player can be seen as divine. It is not just soccer players, of course. We all have this wonderful magic called life. Somehow, only dimly knowing how, we are able to control our own bodies to a great extent. Some people, through talent and training, are able to control them even better. I believe without doubt that there is sports genius, just like there is musical genius or chess genius and others. And like with all of these, the genius cannot truly be brought out and made to shine without effort. Hard work through several years. But the thing is, for the genius it is not just hard work. It is something they feel called to, drawn to. In the anime Aoki Densetsu Shoot, which set off this train of thought, the genius Kubo had a question for all who wanted to join his soccer club: “Do you like soccer?” And those whose eyes lit up when they answered “yes” were the ones who became his team. Obviously, there was never a time in my life when I could have said that about soccer, or indeed any sport. But when I was young, you could have asked me: “Do you like programming?” and my eyes would have lit up in just the same way. I would practice it when no one was looking. I would read about it, think about it, even dream about it. And that is how, when the chance unexpectedly came, I was able to create a debt collection software suite that helped companies in Norway save millions. I did not earn millions, of course, though I did earn a few thousand for a little while, which I wasted. But that was not why I did it. I did it out of love. We don’t think of life as magic, but if we came to a world where stones could move and grow, our first impulse would surely be to see it as magic. But because carbon-based structures do this routinely in our world, it is perfectly natural to us. In a similar way, if we had not seen genius before, we would quite likely be astounded and think it was something supernatural. Or at least our ancestors did just that. In the age before books, we did not have access to the many geniuses of the past. So when a great man (it was usually, not quite always, a man) stood up and did something remarkable, people thought that a god had descended on earth and left his seed among us. Well, I suppose that can happen too, in a very abstract manner of speaking. But my point is that it is just a matter of perspective. We know for certain that our way of seeing things is right, and their is wrong. But what if not? What if genius really is divine and life really is magic? It is not like we can recreate these under controlled circumstances, after all, which is the essence of scientific practice. Yes, I have also read that some scientists have recently created life. On a closer look, they have assembled DNA and inserted it into an existing cell from which they had removed the original DNA. That is creating life in much the same way as playing with Lego bricks is creating matter. Not that it is not respectable, but we are still a far cry from even understanding life, much like creating an equivalent of it from scratch. And the same is the case with genius, I think. But genius without work is like water running into the sea, disappearing without having done any good. That is why Edison, one of the greatest geniuses of modernity, said that genius was 1% inspiration and 99% transpiration. I don’t know about you, but sometimes music comes to me. Hauntingly beautiful melodies or even songs, in languages known or unknown, songs that I have never heard before and never hear again. If I were a composer, I could grasp those melodies and bind them to ink and irrigate the world with their beauty. But I am not, and so after a while they join the river Lethe and return to the endless ocean from which they may have come. I sometimes wonder if this happens to almost everyone, most people, or just a few. But it does not matter, I guess. I never felt a call to be a composer. If you asked me: “Do you really like music?” my eyes would not have lit up. This entry was posted in autobiography, human mind, philosophy by itlandm. Bookmark the permalink. Check this game out. Basically daggerfall in mmo form.